Toronto has historically been a fantastic place to invest in real estate. 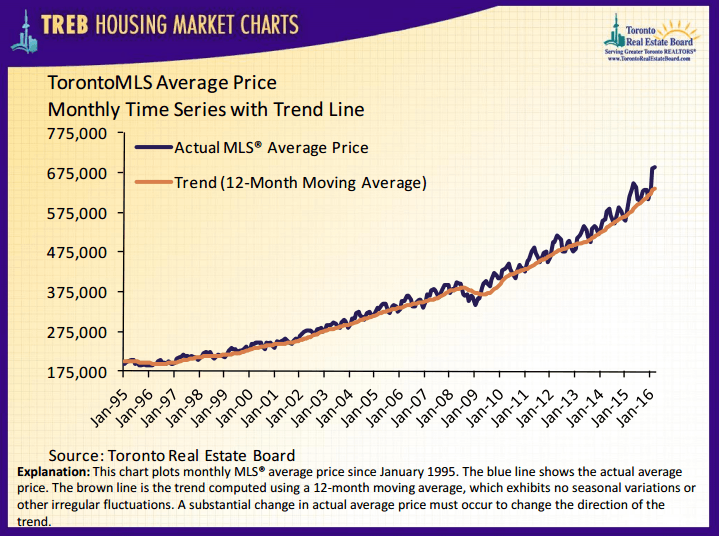 Since 1995 Toronto real estate prices have grown almost ever year and continue to do so at record prices. Our rental pool is extremely small which means properties rent within days of hitting the market and the market rents continue to climb year after year. The best part of all, is unlike other investments where you need to put 100% down (ie. stocks or mutual funds), real estate allows you to invest with as little as 20% down (technically as low as 5% if you will be using the property as your primary residence). Pre-Construction Condos: One of the most popular investments is the pre-construction condo market. Personally, I am finding many of the projects are over-valued making it difficult to turn a profit when the project completes, but there are some projects from time to time that I recommend and even invest in myself. Payment structure on the project can also have an impact as some offer very affordable payment plans. Condo Rental Investing – Condos are one of the easiest types of rental properties you can own because there is very little maintenance required, and most buildings have property managers in place that look after the day-to-day. With a $40,000-$70,000 down payment, you can buy a studio or small 1 bedroom unit which you can rent for anywhere between $1300-$1700 per month. Flipping – We’ve all seen the HGTV shows where they buy a house for $150,000 and do some basic renovations to it only to turn around and sell it for twice the price just a few month’s later. Well, that is the basis of flipping, to buy a less desirable property and make it desirable and sell it within a short period. In some cases this can mean minor renovations like kitchens, bathrooms, paint and floors, but it can also be more complex renovations like adding another story, or completely gutting a place and putting up something entirely different. Multi-Residential – Multi-residential properties are single structures with more than one residential unit. The most basic form of multi-residential would be to buy a house with two self-contained apartments where one or both of the units rent out. For example, buying a house with a basement apartment would be a great entry-level investment because not only are you making money from the property, you also have a place to live. This kind of property is a Duplex. From there you get to triplexes (3 units in one structure), to fourplexes (4 units in one structure) and can go as big as entire apartment buildings where you own hundreds of units. However, if a single property has over 5 units the government labels it as a commercial property and taxes it differently from residential. Commercial – As mentioned above any property with 5 or more units is a commercial property, but there are also other types of commercial properties. Some other examples are storefronts (either with or without residential above), a plaza with multiple store fronts, high-rise buildings where companies have their offices or even entire shopping malls. Commercial properties run like a business, regardless if there are people living there. Vacant Land – Land is a bit trickier to invest in, as the minimum down payment is typically higher than any other real estate investment (around 50%). This basically means just buying a property with no structure on it and sitting on it to either develop at a later time or hope that the value of the land increases. Short Term Rental – With sites like AirBnb, short-term rentals are becoming more and more in demand. Travelers don’t necessarily want to stay in a hotel, and even businesses are using short-term rentals to house their employees that are working remotely for any length of time. These types of rentals are almost always furnished, and rent at a higher price per day than it would cost for someone to stay in a hotel. This area is constantly changing and there are risks involved so it is important to do plenty of research before jumping into this. Also, if you are doing this in a condo, many condos are starting to crack down on short-term rentals and not permitting them to operate in certain condo buildings. These are just some of the investment options, but there are plenty more depending on your situation. If you’d like to discuss more options and get a list of the current investment opportunities in Toronto, contact me today. I have helped clients with buying and selling pre-construction condos, resale condos, commercial properties and multi residential and can help you select the best investment based on your own situation.